Late Preclassic, circa 300 B.C. - 100 B.C. Carved stone sculpture mounted on black metal stand. Provenance: A Private San Diego County, California Collection of Pre-Columbian Art. This object was acquired for the collection in 1969. 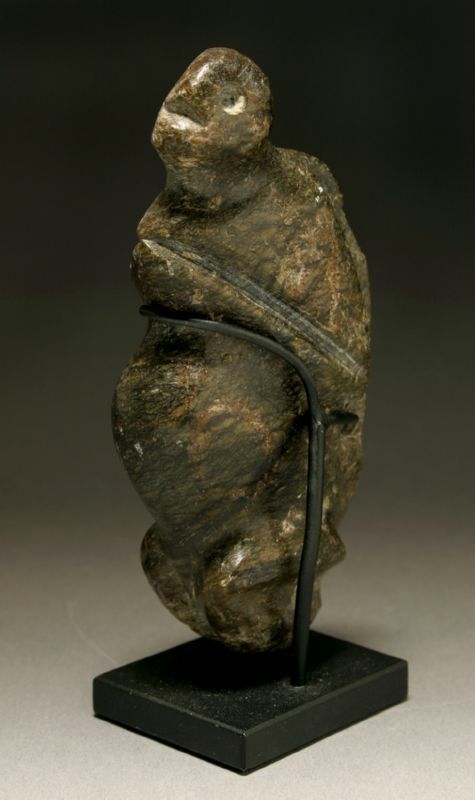 This solid dark stone figure of a monkey was carved to form a head and torso. Incising then created the facial features and the abstract configuration of the arms and legs. A hole was drilled through the back, in ancient times, for the probable purpose of suspension as a type of sculptural pendant.